HOME > POP Hollywood > Hairspray Live! Hairspray Live! 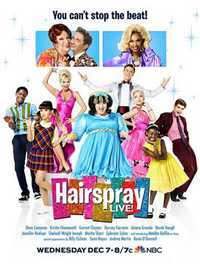 is an upcoming live musical adaptation of the 2002 Broadway musical Hairspray, which in turn is based on the 1988 film of the same name. It is scheduled to be broadcast on NBC television on December 7, 2016. Craig Zadan and Neil Meron are producers of the project. This webpage uses material from the Wikipedia article "Hairspray_Live%21" and is licensed under the GNU Free Documentation License. Reality TV World is not responsible for any errors or omissions the Wikipedia article may contain.